I ordered yarn from ice yarn around September 3rd week by regular mail. Usually it will take 3-4 weeks to arrive in Bulacan. So I expected it to arrive by 2nd week of October. It's almost the 2nd week of October but still no news about my yarn. I was so frustrated about my yarn that I asked my mother to inquire in Post office if there is news about my package As usual laging delay pag sa munisipyo. But the good thing is wala ng malaking charge unlike before. Just P55 pesos to get my package( before I am paying around 1k). Malaki ata ang epekto ng Bistado kaya tinanggal na nila ang additional charge. - White cashemere, merino poymide. Also very thin and soft. - Gray is 70% linen and 30% viscose. It is soft and thin but a little stiff. - Angora Design Self Striping. Combination of Angora, wool and Acrylic. Hairy but sooooo soft. When I got them the first thing is do is hug them and smell them (weird of me or maybe I'm just too happy or excited about my new yarn). Everytime I purchase yarn I am not sure what to make of them. I just stare of them for a long time. ~_~. New yarn New Happiness. Another crocheted toy added to my collections. I really like the owl design and this time I made owl Amiguri. I got acrylic gray with combination of red and white yarn. I bought it from Rosario Pasig years ago. I wanted a doily but instead I made a amiguri. As usual my son love his new toy same with crocheted totoro. Here's the picture of the owl posted in my FB page. I got the pattern free from ravelry. I thank the designer for providing free pattern. http://www.ravelry.com/patterns/library/free-owl-toy-crochet-pattern. The pattern is easy to follow and easy to make. It's been awhile since my last post and last log in but I'm still alive. I've been busy and took a break from crochet and now I'm planning to post more crochet project. 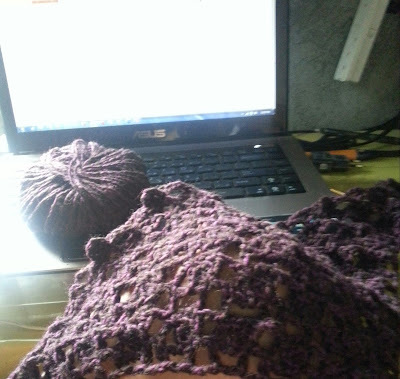 As for my comeback I decided to post my crocheted skirt made from 50% merino and 50% acrylic yarn from ice-yarn. I bought the yarn last January when they had a winter sale and made big discount. For size of the skirt just pm me. The skirt is a simple V stich pattern. I cannot tolerate the cold here anymore. I've been avoiding crochet these past weeks. I wanted to enjoy my vacation and just surf, play with kids, roaming around and chit chat with relatives. But it seems that the scarf is not enough. The cold breeze of the wind in the morning give shivers every time. I didn't bring any jacket and my clothes are limited. So I search for a triangular shawl that's easy to make and will be done in 5-8hrs( har har har). I want an easy pattern that I can finish right away and can use right away. 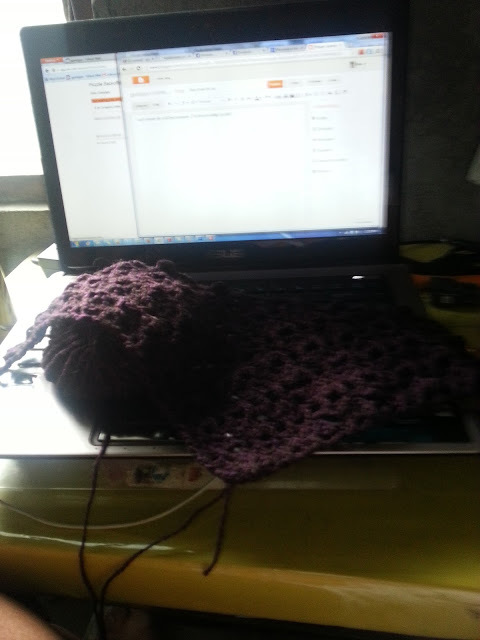 Been crocheting between work so hopefully it will be finish this afternoon. The yarn I'm using is from Ice Yarn. 50% Merino Wool , 50% Acrylic and I;m using size 7/0 hook. The pattern can be found here http://gosyo.shop.multilingualcart.com/free1.php (no. 210-60). Just look for triangular shawl. Late post but not late to greet. It's been a long time since I updated my blog. I got busy with personal and work affairs. 2012 has bee good to me. I started this blog, got more project, saw my mom, started to crochet again, make new friends, and specially found site to purchase beautiful yarns. I am so grateful to 2012 I got a lot of blessings even though I face many challenges. Challenges that make me stronger and make me a better person. So Thank you 2012 and I welcome 2013 with wide arms and open heart. I am looking forward this year. Hopefully more project and my wish( personal ) to make it come through. I'm looking forward to make more crochet project this year and hopefully I can sell but if not that's ok too. I don't want to force myself to crochet and eventually got injured. We also have to take care of our body to make beautiful project. December is busy day. Busy as in you don't have time to crochet, don't have time to go out, don't have time to post and don't have time to shop. I just sit all day in my computer and doing work. As much as I want to whine keeping busy means more money ^^... and more $. So I will just tolerate December's busy day and will enjoy my time next year. This year since I'm busy too much I decided to crochet gift items but sadly I cannot crochet as much as I want so my gift is limited to those who are near my area and to those who I see everyday. I crocheted bag, cellphone case, cute headband and wallet. The pattern I use is from Japanese book I bought last time. I am so happy with the book because most of my gift item patterns came from that book. So below are the pictures and ready to wrap. Merry Christmas Everyone. Just finished crocheting coat.using Podio Merino in size 5 hook.